This summer, we offered an evening storytime. I have a love-hate relationship with evening storytimes. I love that we see patrons that we don't see at our other programs. I hate that attendance is generally much lower than the same program offered in the morning. We tried to attract more attendees by offering a milk & cookies snack with our storytime, but I don't know that it made much of a difference. However, when I actually crunch the numbers it turns out that we had an average of 8 kids per program, which is not a terrible turnout for us. I think maybe it's more that I personally did not like changing up my evenings and being the one to offer this program. It has NOTHING to do with the kids who came - they were great. I tend to thrive on the energy of the kids at storytime and the evening group tends to be smaller and quieter, perhaps more suited to different storytime strengths than I have. Plus, I think I have bitter feelings carrying over from a music performer we hosted on an evening this summer when we only had 2 kids show up. It's not fair for me to project my frustration on to ALL evening programs, but I think that's what I'm doing. If we offer a similar program next summer (we already incorporate an evening session with our fall and spring storytimes), I think we'll require registration (reminder calls seem to help attendance numbers) and, frankly, I think I'll probably see if someone else would like to present this program. Opening Song: "Jump Up, Turn Around" by Jim Gill. We've done this one almost every week (we didn't do it the week I only had 3 kids because I felt it'd be a bit of overkill). Book: Leonardo the Terrible Monster by Mo Willems. 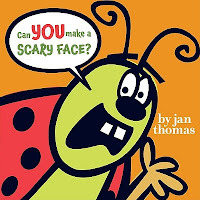 Book: Can You Make a Scary Face? by Jan Thomas. This was SUCH A HIT! The kids loved doing the actions along with the book and they got really into it. 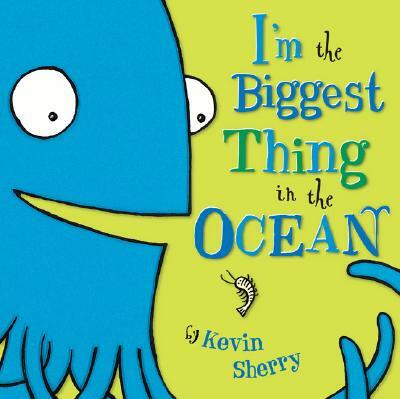 I'm always a little scared to read this book because what if the kids don't go along with it? But you know what? They always have. I should just relax. Rhyme: Five Little Monkeys Jumping on the Bed. I told this one with a flannel mitt and little velcro monkeys that we had. Book: Aaaarrgghh! Spider! by Lydia Monk. Song: "The Freeze" by Greg & Steve. I didn't actually have a song prepared for today, but I got a special request so I pulled it out. This one's a little longer than I wanted, so I stopped it at one of the freezes about halfway through. Felt Activity: I Have a Crayon. Click through that link to find the full rhyme. I passed out different colored crayons to each child and had them put them on the board as I said their color. 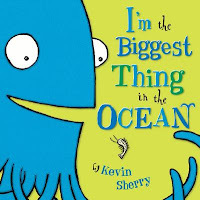 Book: I'm the Biggest Thing in the Ocean by Kevin Sherry. Lots of the kids were familiar with this one, which is always fun. And then we had our snack of milk & cookies! I posted before some lessons about milk & cookies with storytime when we offered this program over winter break. I would add to that advice that 2% milk seems to go over the best and make sure you can offer at least water to any kids who can't drink or don't like milk. Also, I wish I had had our fall program publicity done a little sooner so I could have handed out information about our fall storytimes (which include an evening class time). September seems pretty far off, so I don't know that they would have held on to the info for that long, anyway. I at least made an announcement and hopefully some of them will remember to check back or think of the library at some point this fall!